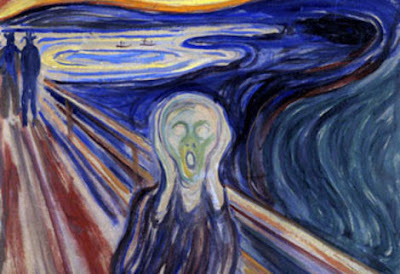 I saw The Scream on one of my daily reads recently. It aptly shows Memo's reaction to what Dr. Polo's scales told him today. I was less hysterical after my turn. I've never had to toggle the big weight from 80 to 100 before today. I had to leave it on the 80 kilo mark and move the slide all the way to the 20 kilo end mark. Enough. I found this article in the New York Times today. It describes a new housing development in Baja California, Mexico. It suggests that with the Boomers retiring many may find themselves doing so in Mexico. If the vision of the Mexican government and an American developer is realized, a decade from now Loreto Bay will include 6,000 homes, from small condos to 3,800-square-foot custom houses, most of them probably to be owned by American retirees or part-time residents. That's okay. 'Xcept, let's not let Axixic get too crowded.